We often get asked what the difference is between the two. Unless you go for a jacket with a tailcoat, there is no difference in cut between a suit and a tuxedo. In today’s fashion world where the lines between a tux and suit are blurring, the biggest difference remains the use of satin: a tuxedo usually incorporates satin on the lapels, buttons, pocket trim and even down the leg of the pants. A suit doesn’t have any satin accents and the buttons are plastic, bone, metal or covered in the suit’s fabric. Here’s an example of one of our SF Tailors suits in regular and tuxedo version. The suit has the exact same design, only the satin accents are different. And what a difference in style that makes! 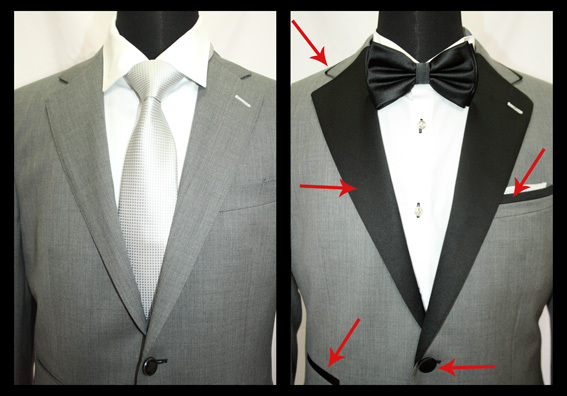 When it comes to the finishing touches, tuxedos are traditionally worn with a bow tie and vest or a cummerbund. Suits are more versatile and easy to dress up or down. They can be worn with or without a vest, with a bow tie or a long tie. Fortunately the rules are not as strict as they used to be: nowadays it’s acceptable to wear a bow tie with a suit and a long tie with a tux. It’s all a matter of personal style. Trust us, nobody will call the “tuxedo-police” if you put together a combination that would have been frowned upon in the past. In today’s fashion world there are exceptions to every rule. What’s the best choice for your wedding suit? As far as we are concerned, there is no wrong or right choice. Everything depends on you, your personal style and the message you want to send. About 50% of our customers choose a beautiful tuxedo to walk down the aisle. The other half opt for a well-made suit to dazzle their bride. You will probably get more wear out of a suit after the wedding. Many occasions call for a suit and every man should have at least one sharp looking one in his closet. If you wear suits for your job, the investment pays of even more. On the other hand: do you want to get married in the same outfit that you wear to go to work? 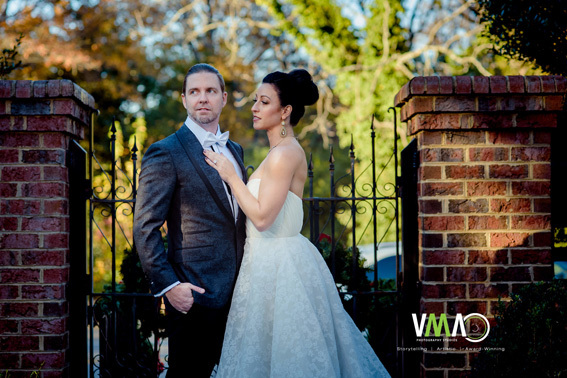 You will look dashing in any of our perfectly tailored suits, but so can all your guests. Now is the day to stand out. Tuxedo’s are considered evening wear. If your wedding is during daytime, a suit might be more appropriate. Think about your wedding theme: some themes will go better with a tuxedo than others. Consider what your bride is wearing. You probably aren’t allowed to see her dress until the day itself, but make sure that you know the style, so you look like you belong together when saying I do. For a lot of weddings both a tuxedo and a suit will do, so it’s up to you to decide what you want. Your wedding day is a unique day, it deserves an outfit that is just as memorable. But most importantly, it should be an outfit that you like and feel comfortable in. After all, it’s your big day too…. Good to know: when you go shopping, a tuxedo will usually cost you more than a suit. However, there is no difference in price between a tuxedo and a suit from SF Tailors! ← Our First Fashion Show!